As Mexico “Absorbs” Central American Refugees, Record Numbers Reach the U.S. The meeting of world leaders that President Obama convened on Tuesday to rally support for refugee resettlement and inclusion across the globe was good diplomacy but contradicts Washington’s policies even in the Americas. At a meeting on the margins of the UN General Assembly, Obama thanked Mexico for “absorbing a great number of refugees from Central America,” yet the data make clear that Mexico is hardly absorbing refugees. During the first seven months of 2016, as WOLA has reported, Mexico granted asylum to just under 1,150 Central Americans but deported over 80,000 others. Meanwhile, far greater numbers of Central Americans have reached the U.S., principally women with children (whom U.S. Customs and Border Protection labels “family units”) and minors traveling without a guardian (“unaccompanied children”). With one month remaining in Fiscal Year 2016, apprehensions of Central American women with children total over 61,000 – up 79 percent from FY15 – and are on pace to surpass the FY14 record. Likewise, apprehensions of unaccompanied children have already exceeded the FY15 total, and September numbers will likely push the current tally of 42,000 just shy of the FY14 record. U.S. support for Mexico’s Southern Border Program has resulted in unprecedented numbers of both detentions and deportations of Central Americans in Mexico, yet the dramatic increases in arrivals to the U.S. and shifting points of entry – including an upswing in seaborne trafficking – suggests that the exodus from the Northern Triangle continues and that human smugglers have adapted to stepped-up enforcement measures by forging new routes through Mexico. Ongoing raids by U.S. Immigration Control and Enforcement (ICE) authorities, which under the banner of Operation Border Guardian aim to roundup unaccompanied youth who had been ordered deported from the U.S. and have recently turned 18, have not stemmed the tide of new arrivals fleeing untenable circumstances in their countries of origin. Despite a July 2016 expansion of the CAM Program for in-country processing of youth applications for refugee status and for others in Central America asserting that they are at risk of harm, the pool of beneficiaries remains miniscule. Whereas the program had received 9,500 applicants by mid-year, only around 270 had been resettled in the U.S. With a six- to eight-month processing period and room for only 200 applicants at a time at shelters that have been set up in Costa Rica, desperate Central Americans continue to turn to more efficient human smugglers. Public messaging campaigns launched in the region with U.S. government funding, to warn Central Americans of the dangers involved in irregular migration and to dispel misperceptions regarding U.S. immigration policies, also appear fruitless, as outlined in a recent American Immigration Council report). President Obama’s efforts to galvanize international action in response to forced displacement worldwide highlight his own administration’s shortcomings in addressing refugee flows closer to home. Expedited hiring of border patrol agents and an increase in the number of beds at contract detention facilities, among other domestic measures, have enabled the administration to process large volumes of Central American migrants while avoiding the appearance of a “border crisis” akin to 2014. Meanwhile, an emphasis on curtailing outflows from Central America (without regard to the justification of people’s decision to flee), detention (rather than absorption) in Mexico, and deportation in both Mexico and the U.S. has not been matched with analogous investments to address the needs of Central American migrants already in the U.S. who may have legitimate claims for asylum or other forms of protection. Central American families and unaccompanied children, for example, now account for over one-fourth (26 percent) of the 512,000-case backlog in immigration courts, yet only 53 percent of families and 56 percent of unaccompanied minors have access to attorneys. In failing to guarantee legal representation for these vulnerable populations the administration is sidestepping the same moral obligation to thoroughly vet and provide safe, inclusive communities for refugees that President Obama challenges other governments to fulfill. Perhaps funding that is supporting Mexico’s strategy of detention and deportation could be better allocated to programs that ensure proper adjudication of asylum claims – in both Mexico and the U.S. – and to genuinely seek to absorb individuals and families who, through due process, are judged to qualify as refugees. Voting irregularities, a lack of transparency, and accusations of fraud have marred several successive elections since Ortega’s return to power in 2007. In June of this year, Ortega announced that he would not permit international election observers to monitor this fall’s elections. Weeks later, the Supreme Court stripped opposition leader Eduardo Montealgre of his position as head of the Partido Liberal Independiente (PLI) and replaced him with Pedro Reyes, considered by observers to be an Ortega ally. In July, Nicaragua’s electoral council removed 16 sitting members of the National Assembly and 12 alternates after they refused to recognize Reyes. In August, Ortega announced that Rosario Murillo, his long-time partner and wife since 2005, would serve as his vice presidential candidate in the November election. Murillo has been a prominent figure in the Ortega government while serving as both first lady and chief spokeswoman. Her political ascension is complemented by the rise to prominence in recent years of her and Ortega’s children as operators of business and media interests, including the couple’s eldest son and presidential adviser on investments, Laureano Facundo, who helped sell the stalled interoceanic canal project to Chinese businessman Wang Jing. Nicaragua’s opposition parties have thus far been unable to mount an effective response and have shown the lack of cohesion and focus that have plagued them for decades. Montealgre announced that the coalition led by the PLI would boycott the election and called on others to do the same. But rather than present a united front, opposition leaders are fighting amongst themselves to seize the mantle of leadership and challenge Ortega through several competing parties and coalitions. This will be no easy task: polling conducted by M&R Consultores this summer shows that over 60 percent of voters are likely to vote for Ortega, with the leading opposition parties drawing low single digits. Over a quarter of potential voters said they were unsure whom they would vote for. With the opposition beset by division and lacking much legitimacy – tainted as they are by a history of corruption, self-interest, and financial support from the United States – it is unsurprising that protests and civil unrest have been largely absent. The ouster of the PLI delegates has also stirred the FSLN’s old opponents outside the government, who have been largely quiescent in recent years but condemned the decision: the Bishops of the Episcopal Council, the Nicaraguan-American Chamber of Commerce, and the Consejo Superior de la Empresa Privada (COSEP), the largest business chamber that has enjoyed a working relationship with the Ortega government. The FSLN’s authoritarian turn, Ortega’s long reign, and the rise to prominence of both Murillo and the couple’s children invite comparisons between Ortega and Somoza family dynasties. It may be from COSEP and the business sector, rather than among the weak and divided political opposition, that a serious challenge to Ortega could eventually emerge. It was after all the defection of non-Somoza family interests in the private sector, combined with a popular insurrection led by a guerrilla insurgency, that did away with Nicaragua’s previous family dynasty. But that combination only emerged following the shock of the 1972 earthquake and resulting massive corruption, the assassination of a national figure like Pedro Chamorro in 1978, and the particularly bloodthirsty turn that the Somoza regime had taken. With similarly game-changing circumstances absent at this juncture, the sort of cross-sector revolutionary movement that ultimately toppled the Somozas appears unlikely. For the moment at least, an Ortega family will be well on its way to firmly preserving its dynastic power come November. * Aaron Bell is an Adjunct Professorial Lecturer in History and American Studies at American University. The Obama Administration’s repeatedly stated commitment to continue implementing the Cuban Adjustment Act of 1966 is driving a surge in Cuban emigrants through dangerous human trafficking routes in Central America and causing tensions in a region already tied in knots over illegal migration. The flow of Cubans up the isthmus has been increasing steadily – reaching some 45,000 over the past year – but seemed a manageable issue until Costa Rica broke up a smuggling ring last month. 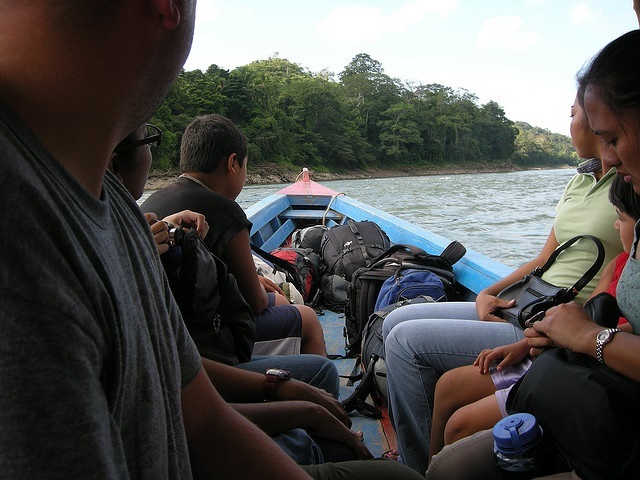 The publicity prompted Nicaragua to close its borders to the underground railroad, which is carrying thousands each month northbound. The migrants have been starting their journey by air from Havana to Ecuador (which until last month didn’t require a visa) and are escorted by coyotes as they bribe their way across borders headed north. A summit of Central American foreign ministers two weeks ago failed to reach agreement on a Costa Rican proposal to create a “humanitarian corridor” for the Cubans by issuing them safe passage. Relations between San José and Managua, already on edge as they await an ICJ decision this month on a territorial dispute, have turned bitter. The special treatment that Cubans receive upon setting foot in the United States – including automatic access to permanent residency in one year – is the main stimulus of the flow. The Clinton Administration adjusted how it handled those intercepted at sea, establishing a distinction between intending migrants with “wet feet” and “dry feet,” which reduced the seaborne flow somewhat. But Cuba’s decision in 2013 (long urged by the U.S. and international community) to stop requiring citizens to get exit permits; the flow of a billion-plus dollars into Cuba through remittances and small businesses (with which to pay coyotes and corrupt officials along the way); and the growing sophistication of smuggling networks in Central America have fueled a shift in the flow overland. Despite the Administration’s no-change pledge, some intending migrants say the current rush is being driven by fear that U.S.-Cuba normalization will end the preferences granted to Cubans who reach U.S. soil. The Adjustment Act authorizes – but does not require – the President, through the attorney general, to grant parole to Cubans arriving into the United States illegally and grant them permanent residency one year later. In the absence of any change in Washington’s approach, Cubans will certainly try to avail themselves of its generous provisions. To move the thousands stuck in Central America off the front page there, Washington may issue them expedited visas and help them with transportation to the United States. Such gestures, however, will have a high political cost throughout Central America, where the U.S. has asked governments to stanch the movement of their own citizens fleeing violence and dire poverty, and where even well-off, law-abiding citizens have to jump through hoops and pay hundreds of dollars for tourist visas. As the impasse in Central America grew intense last month, the State Department tweeted a reminder that “There exist legal and safe options for Cubans who want to migrate to the United States.” Reversing policies that encourage illegal and unsafe migration – while proposing that Congress support a doubling or tripling of the current 20,000 Immigrant Visas the Embassy in Havana issues each year – would make a lot of sense. AULABLOG will examine the powerful “push” factors driving migration from Cuba in a subsequent article. Remittances to Latin America hit a record high in 2014 at $65.3 billion, according to the Multilateral Investment Fund of the Inter-American Development Bank, but their impact on development would be much greater with better coordination between sending and recipient communities. Mexico receives over one third of those funds, but remittances represent a significant component of GDP for many countries across the region. The bulk comes from the United States, where 54 million Hispanics include 19 million first-generation immigrants, according to 2013 U.S. census figures. In several Central American and Caribbean countries, funds sent home by migrants represent the largest single source of foreign exchange. Remittances alleviate poverty by contributing to household income, helping to satisfy basic consumption needs, and sometimes enabling savings and investments in education. Groups of migrants from particular communities sometimes pool resources through hometown associations to support shared objectives back home. A paved road or a new soccer field affects quality of life in tangible ways, and émigré financing of local political campaigns can determine the results of elections for mayors and other officials. But remittances seldom promote local economic development initiatives that will generate sustainable incomes and opportunities for wide segments of the population – missing opportunities to address the causes of migration in the first place. Some governments, development agencies, and philanthropies look to remittances as a potential mechanism for ensuring that Latin American citizens enjoy living conditions that afford them the “right not to migrate” from home communities. Last month the Inter-American Foundation (IAF) and the Center for Latin American & Latino Studies (CLALS) convened a workshop to explore the challenges and opportunities for linking diaspora organizations in the United States, their communities of origin in Latin America and the Caribbean, and potential philanthropic partners to advance community development in the region through the effective deployment of remittances. Participants identified several challenges. Cooperation between immigrant-led diaspora organizations and their sending communities and governments is not a given. Despite some research into hometown associations – created in the United States by migrants to connect with their communities of origin – we have relatively limited knowledge about how they function and the conditions that enable them to support community development. Effective transnational cooperation requires broad multi-sectoral partnerships aligning immigrant-led groups, sending community organizations, and possibly governments and international funding institutions. Despite information gaps and practical obstacles, there are successes to celebrate, such as the Salvadoran Fundación para la Educación Social, Económico y Cultural, with which the IAF has partnered. Technical training on how to handle incoming funds and face-to-face meetings between participants and supporters in the United States and El Salvador have promoted transparency and trust. Participants in the CLALS/IAF workshop offered several potential avenues for community organizations and philanthropic foundations to build enduring institutional connections. It was agreed that further research should be conducted on hometown associations and other forms of diaspora organization to better understand how they function, how they relate to their affiliated sending communities, and how they can be catalysts to promote local development. Policy-based research institutions in Latin America should be brought into the conversation, as should mainstream Latino organizations in the United States. And immigrant associations and their counterparts in Latin America should not have to grapple with complex development challenges alone. Indeed, U.S.-based community organizations and philanthropies could play a valuable role in catalyzing cooperation aimed at promoting development by making the case for public policies and transnational collaborative efforts that support “the right not to migrate.” Such development-supporting initiatives could, at least in theory, gain resonance across political groupings in the United States, appealing both to those interested in fostering global development and those concerned about immigration. Mexico’s get-tough approach has prevented a significant number of migrants from reaching the U.S.-Mexico border. According to U.S. Customs and Border Patrol, the first seven months of Fiscal Year (FY) 2015 witnessed a 48-percent decrease in unaccompanied child apprehensions and a 35-percent decrease in family unit apprehensions along the U.S. border. However, considered in light of the unprecedented number of deportations from Mexico, these figures suggest that child and family migration from Central America remain at historic highs. Central American children detained in Mexico are unlikely to be offered forms of humanitarian protection mandated by international law. Despite increases in child detention and deportation, a report by Georgetown University Law School’s Human Rights Institute points to inadequate screening and arbitrary detention as among the obstacles preventing tens of thousands of children from seeking and receiving relief from removal. Both Mexican and U.S. data show that a growing share of child and family migrants are Guatemalan. According to analysis by the Pew Research Center, the number of Guatemalan children deported from Mexico during the first five months of FY15 doubled since the same period last year and now accounts for 60 percent of all child deportations from the country. Meanwhile, the share of child deportees from Honduras dropped from roughly one-third to less than one-quarter, and those from El Salvador fell off slightly to just above 15 percent. An analogous shift is also evident at the U.S.-Mexico border where Guatemalans now comprise 35 percent of unaccompanied child apprehensions compared to 25 percent during FY14. Similarly, the proportion of Salvadoran and Honduran children has declined from roughly 25 percent each to 18 and 9 percent, respectively. Smugglers and migrants are already adapting to heightened enforcement in Mexico and charting new, more dangerous routes north. Local media reports have covered migrants’ attempts to bypass border checkpoints by sea and traverse Mexico undetected on foot or in third-class buses. Data show that successful migrants are crossing into the U.S. at less traditional and harder-to-access points. At the height of last year’s crisis, the majority of migrants were surrendering themselves to border officials in the Rio Grande Valley along Texas’ southern-most border. While apprehension in the Rio Grande control sector have decreased significantly this year, three sectors – Big Bend (Texas), El Paso (Texas and New Mexico), and Yuma (California) – have registered at least double-digit percent increases in both child and family apprehensions. During Mexican President Peña Nieto’s recent visit to Washington, President Obama stated that he “very much appreciate[d] Mexico’s efforts in addressing the unaccompanied children [crisis].” Despite applause from the White House, Mexico’s aggressive border enforcement – driven at least in part by U.S. encouragement and funding – has implications for Mexico’s already problematic human rights record. While it is true that Mexico’s actions have largely staved off a repeat of last year’s crisis, it has yet to translate into the sort of political bargaining chip the Obama administration has hoped might sway the immigration policy debate in the U.S. With comprehensive immigration reform legislation long dead and recent executive actions on indefinite hold, the administration apparently hopes that ramped-up enforcement will improve prospects for congressional approval of $1 billion in development assistance to the Northern Triangle. But with Mexico’s clampdown blocking another surge of migrants into the U.S., many legislators are likely to question the prudence of pouring more money into corrupt, dysfunctional regional governments. By backing the militarization of Mexico’s southern border, moreover, the administration is privileging political goals at the expense of humanitarian objectives and is indirectly complicit in blocking thousands of Central American children from accessing lawful forms of relief for which most are likely eligible. Meanwhile, Mexico’s migrant extortion market continues to boom as vulnerable children and families seek new routes north at the mercy of increasingly brutal transnational networks.